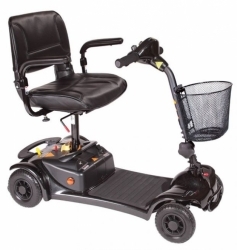 A mobility scooter, rather than a powered wheelchair, is probably the right choice if you can travel relatively independently, get on and off the scooter on your own, and are able to use a bicycle style steering column, or tiller. We've grouped our disability scooter range into three different categories - small, medium and large, to make sure that you choose the mobility scooter most appropriate to your needs and lifestyle. 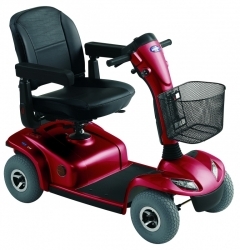 Suitable for longer distances and rougher surfaces, these scooters can carry between 20 to 35 stone in passenger weight. Due to the size of these scooters, you’ll need to have space to store them in a secure, locked area. All Motability large scooters are classified as Class 3 products by the Department for Transport so must have road tax (provided free of charge by the DVLA); this can be arranged for you by your dealer. 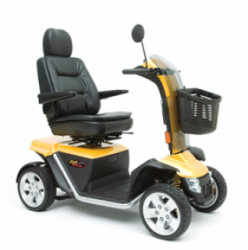 They can travel up to 8mph on the road (4mph limit on pavements). Make sure you are highly visible if travelling on the road especially if the weather is bad. Fluorescent clothing and good lights can help with this. Try not to travel in the dark or the cold, as your personal health and safety may be put at risk.